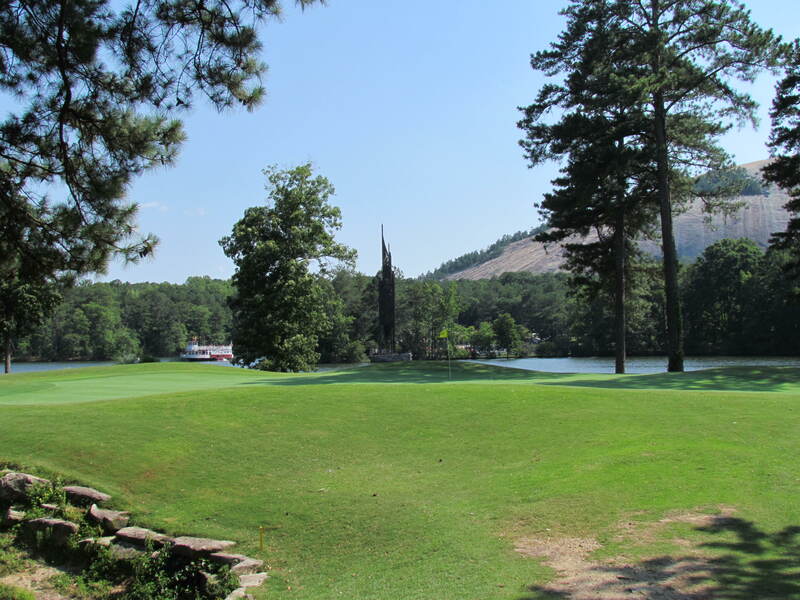 Today, I review the golf course at Stone Mountain Park. Specifically, I review the Lakemont Course. Stone Mountain Park is close to where I grew up. As such, I am pretty familiar with the park and its attractions. When my friend recently suggested we visit the golf course, I thought it would be a good subject for review here on the PF. Stone Mountain Park (http://www.stonemountainpark.com/) is a park built around a natural monument east of Atlanta, GA. “Stone Mountain” is a monolith–essentially, it’s a large outcropping of granite. Although it is technically not a “mountain,” it is definitely a large rock. Many years ago, crews carved a picture of Civil War heros into the side of the mountain–similar to Mount Rushmore, but not quite as grandiose. The park has many attractions–including the laser show, a walking track around the mountain (about 5 miles) that joggers and cyclists use for exercise, a trail to walk up the mountain, and a ski lift for those who don’t want to walk. From the top of the mountain, you can see 7 states (or so I’m told). 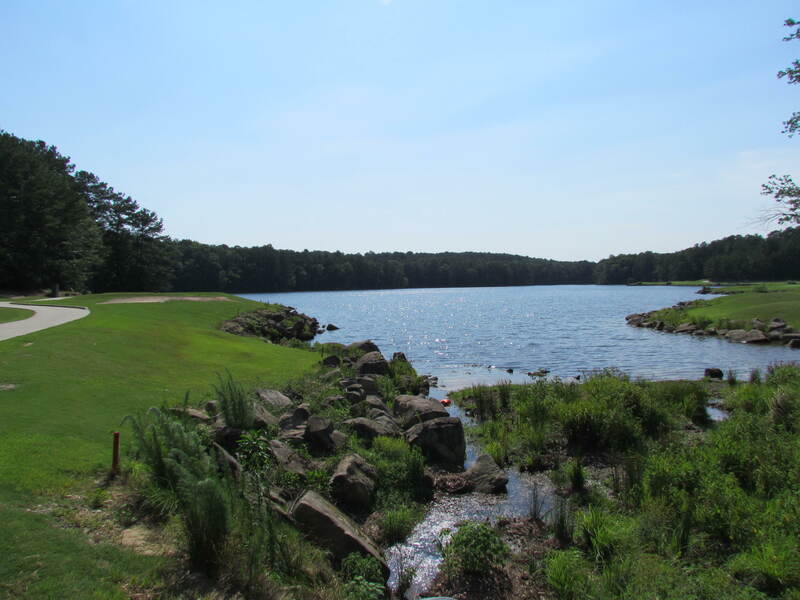 Stone Mountain Park also includes two golf courses–and, to understand some of the nuances, you must understand the history. The first, Stonemont, was designed and built by Robert Trent Jones, Sr. in 1969. 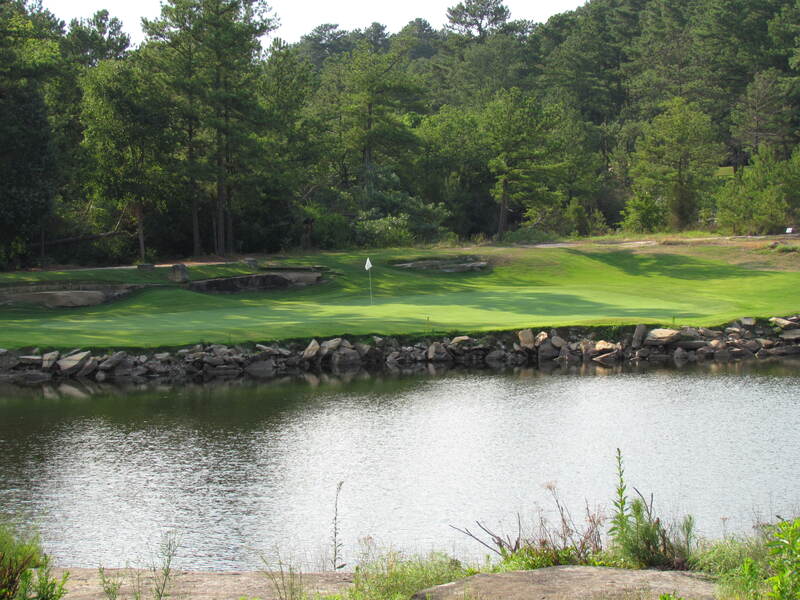 The Stonemont course lay by itself for almost 30 years, until, in 1988, Stone Mountain Park built the Lakemont course. 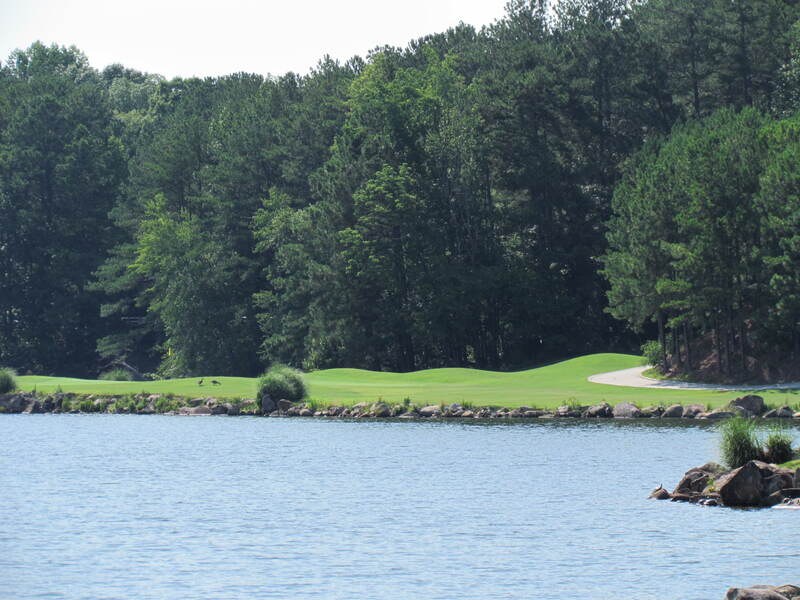 The Lakemont course encompasses much more of a resort feel to it and was intended to focus at least some holes around Stone Mountain’s new man-made lake. In order to do this and to maintain two full 18s of play, two new 9 hole courses were added. 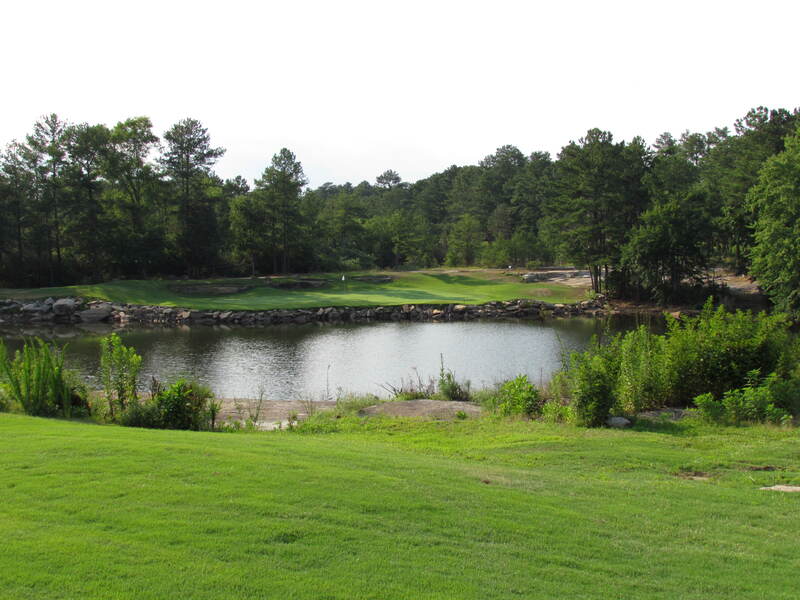 Originally, the “Lakemont” was only a 9-hole course. 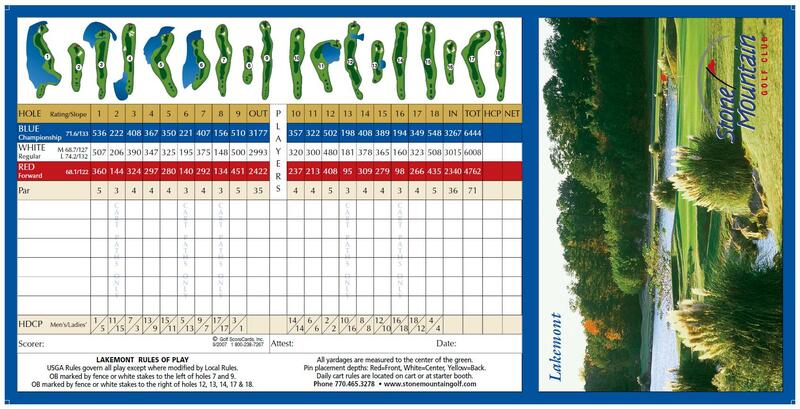 A new 9 holes was built that became the back 9 of the Stonemont course, and the original back 9 of the Stonemont course was renamed “Woodmont,” wherein the Lakemont and Woodmont would play together as one 18. In the late 90s or early 2000s, the courses were again re-routed; the original Stonemont was put back together to preserve the RTJ layout. The two “new” 9s were then combined and called “Lakemont” together. I have played all of the courses a great number of times, but understanding this history helps understand the distinction in the courses. The Lakemont course includes spectacular views, there is no doubt–like the water wheel boat and carillon (http://en.wikipedia.org/wiki/Carillon–the brown spikey looking thing in the background) in the pictures below. The terrain is very undulating, making for some interesting changes. The course is generally well-kept, and the greens fees are reasonable at certain times of the day–$29 at twilight (4PM) on a weekend. Because of the breakup of the 9 holes and the reorganizing of the course, there is approximately 3/4 of a mile between the 9th green and the 10th tee. The 11th hole was built along an old rock quarry. While being an intersting-looking hole, it is quite a strange hole to play, as the player must hit a 5-iron or less off the tee and play a 140-160 yard shot into the equivalent of an island green (see below). The strange layout lets up a bit after the 11th hole, as most of the following holes are decent and fair, but the course sacrifices a lot for the sake of good views. As a 1 or so handicap, I found myself leaving the driver in the bag a lot, which is not something I want to do given the fact that I really like to hit my driver. My first “driver” was on the 10th hole, and I really should not have hit it until the 12th hole par 5. All-in-all, I pulled driver 4 times and could easily have decided only to hit it twice. At 6440 yards from the tips, the par 71 course feels a little janky. We all hate the guy who goes to the movie with you and tells you, after the movie, that you should’ve read the book because it was so much better and really fleshed out the details. That’s what I feel like sometimes giving these reviews. 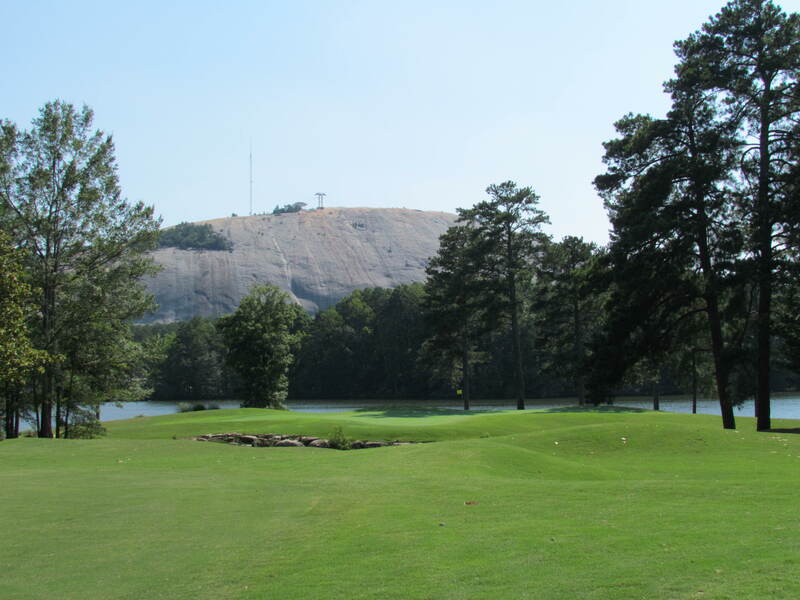 Most golfers just want a fun golf experience, and, if you hit the ball under 240 with your driver, Stone Mountain’s Lakemont course is certainly fun, interesting, and beautiful. 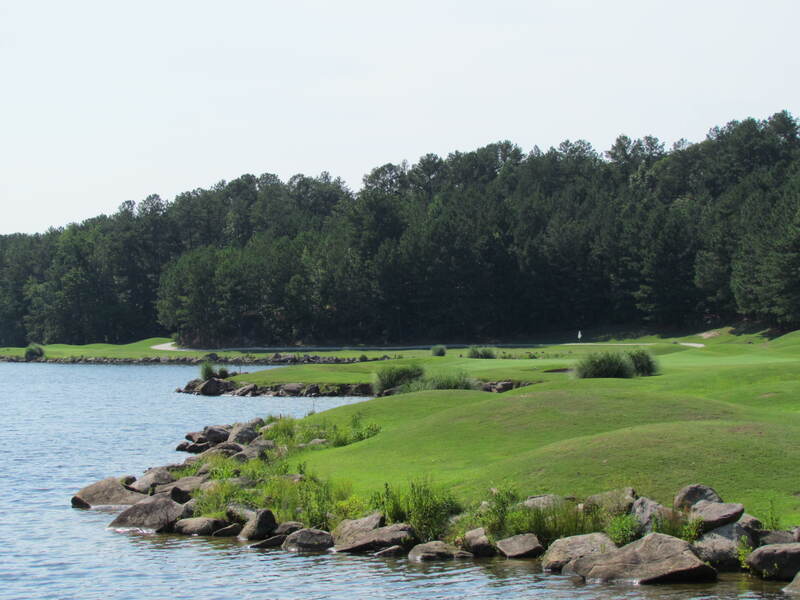 However, for the golfer looking for a challenging experience that tests all facets of the game, the Lakemont course is not the one to play–Stonemont, an RTJ design at over 7,000 yards, is a much better bet for the money. Moreover, the course was not exceptionally well-kept as it used to be. The fairways were cut and had grass, but the greens were fairly shaggy. This may be a result of the lack of rain in Georgia and the desire of courses to keep their bent grass greens (which are becoming a dying breed, not only from the heat but also because they are being replaced by tiff and champion bermuda around these parts). However, the course used to be kept in immaculate conditions; I remember those days, and I only wish they would return. 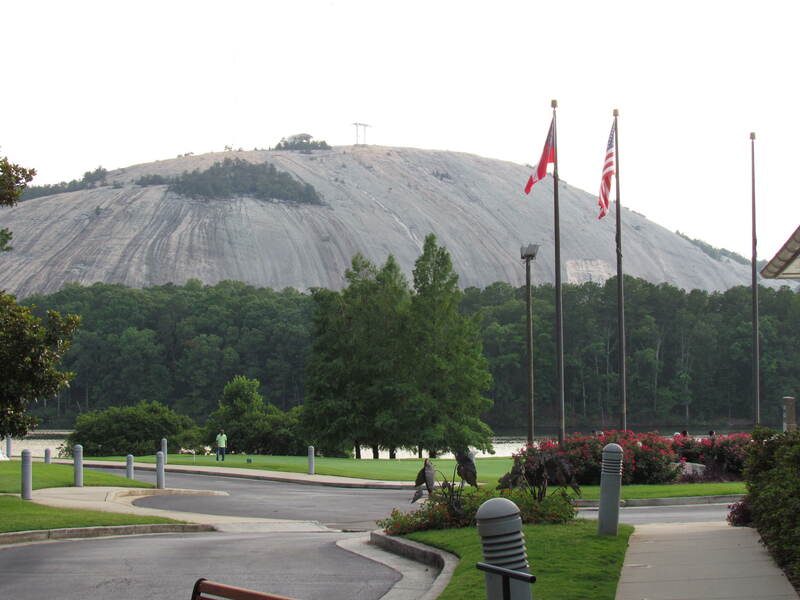 You should know, before going, that there is a $7 gate fee to enter Stone Mountain Park. However, the golf course will give you a $5 discount for showing the parking receipt. Played Lakemont course yesterday first time in 6yrs or so.We were so dissapointed in the lack of care for this course. All greens were bumby and fairways were just as bad.So many ducks on the course leaving waste everywhere this state treasure has been so badly managed I will not go back to golf.Shame on the management staff!